Securities and Advisory services offered through KMS Financial Services, Inc. a registered broker/dealer and a member FINRA and SIPC. This is not an offer to sell securities, which may be done only after proper delivery of a prospectus and client suitability is reviewed and determined. Information relating to securities is intended for use by individuals residing in AK, AZ, CA, CO, HI, ID, IA, MT, NV, NM, OR, UT, WA, WY. 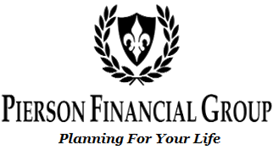 KMS Financial Services, Inc. is NOT affiliated with Pierson Financial Group.